Let’s face it. Ailments and injuries don’t only happen during the daytime hours, and many doctors’ offices are open only during the day. It used to be that the only option after the doctor’s office closed for the day was to go to the emergency room. Now there is another choice: pediatric urgent care. Because of this choice, it’s important to know which facility can handle your needs effectively, efficiently, and at a reasonable cost. Here are some tips to help you decide. Your child has a fever if > 6 weeks (younger needs to go to ER for fever). Your child has symptoms like coughing, congestion, sore throat, ear pain, or headache. Your child has painful urination. Your child has stomach ache, vomiting, diarrhea. Your child has jaundice, eye discharge. Your child is uncomfortable, sick, or injured, but their life is not at stake. Your child has a minor injury or laceration. There is a life-threatening situation. Your child is not breathing. Any condition that might need surgery. Any illness that would require hospitalization. Any situation where you think your child’s life might be at stake. If your child experiences any life-threatening situation, immediately call 911 or go to your nearest emergency department. For many other non-life-threatening issues, the emergency room may not be your best bet. It may be crowded, and because patients are seen in order of seriousness, you might have to wait a while. Once you are seen, the costs—even after insurance—could be expensive. Instead, come to NightLight Pediatric Urgent Care. We have pediatricians who can assess your child’s situation, and we have the equipment needed to run tests, take x-rays, and more. We work with most insurance plans to help keep your costs down. You can even use our “skip the wait” feature by signing in on our website and waiting comfortably at home until it is your child’s turn. 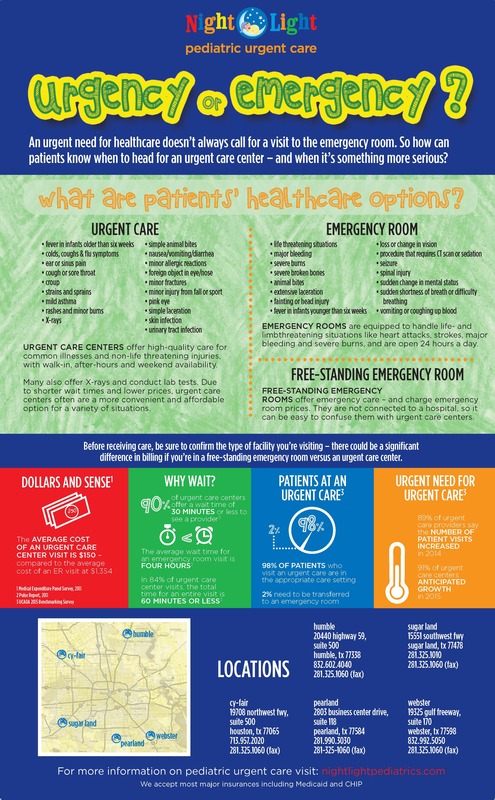 Click here for a helpful summary on choosing between going to an urgent care center vs a emergency room.